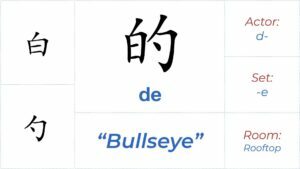 If you’ve read our story, you’ll know that our respective paths to fluency and literacy in Mandarin could have gone a lot smoother. 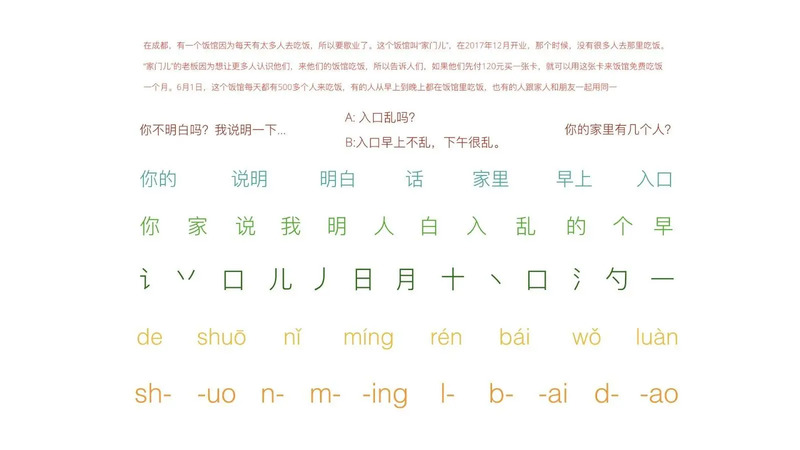 Just about everyone we know who made it to advanced fluency and literacy in Mandarin had many challenges along the way. We all have one thing in common: A lack of understanding of how to learn a language effectively. In today’s article, we are going to explore precisely what went wrong for us, and what still goes wrong for so many others. We’re going to start by gaining a clear understanding of the terms “top-down,” “bottom-up” and “holistic” learning. Bottom-up learning means starting from the smallest parts of the subject at hand and working your way up to more complex pieces. When learning Spanish as an adult, you start by learning how to read, write and pronounce the alphabet, then simple words, then phrases and so on. “Top-Down” means learning something without having a full understanding of how all of its component parts function. 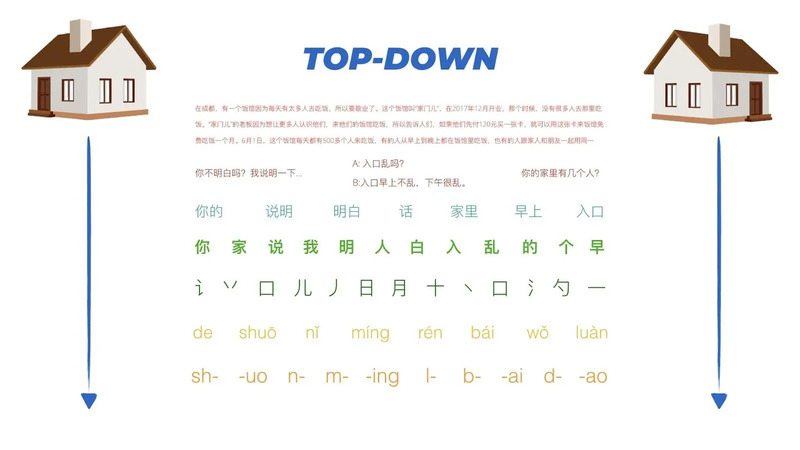 As applied to Chinese, learning whole phrases without first learning the characters or words within them, or even learning characters without an understanding of their components is “top-down.” For example, you learn “厕所在哪里? 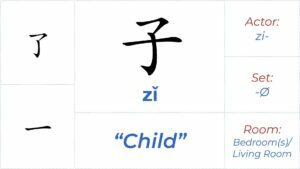 cèsuǒ zài náli” without knowing any of the characters. Why would you do that? 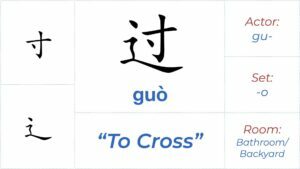 Because 厕所在哪里 means “where is the bathroom?” and the context of your life (if in China) will demand you learn this. If you focus on bottom-up learning too much, by mainly memorizing chunks of information (characters, components, words, etc.) 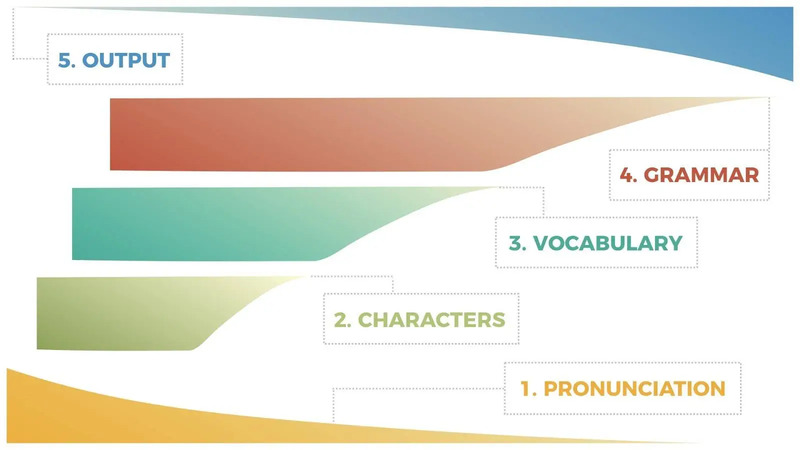 without ever applying them or seeing them in context, you end up “not seeing the forest for the trees.” Despite a vocabulary in the thousands, you’ll take a very long time to reach your goal of literacy and fluency because you only acquire the language by reading and listening to words in context. You’ll end up investing all of your time building up these chunks of information that float around in your head, never being fully utilized or understood. As you can imagine, this gets rather boring and demotivating pretty quickly. If, on the other hand, top-down learning is your primary focus, then you will have a very different problem. If you merely repeat phrases over and over or try to tackle walls of text before developing at least a foundational knowledge of the individual characters and words involved, you will find the learning process stressful and the recalling process frustrating. Due to a lack of solid foundation upon which to build your knowledge, you will find it very difficult to hang on to new information. This rapid forgetting curve is precisely the problem that faces most students learning a language using traditional methods. Teachers spend a fraction of the time they should on pronunciation, leaving lots of gaps in your knowledge that grow over time, and they often start teaching you grammar and vocabulary without teaching characters effectively. Such an approach is a recipe for disaster. Started reviewing sentences based on what he knew, i.e., learning words in a context he could understand. Finally, his ability began to develop rapidly. As you can see, it’s a bit of a mess, and not necessarily because all of the individual steps were inherently erroneous ways of learning the language. He focused far too much on one activity at a time, whether that was speaking, learning characters, or grammar. Instead of creating a well-constructed house, he was creating several piles of bricks, occasionally sticking a few together with cement. The order he took on these various activities was also wrong. He was trying to read before learning characters or trying to speak before learning vocabulary through listening and reading. 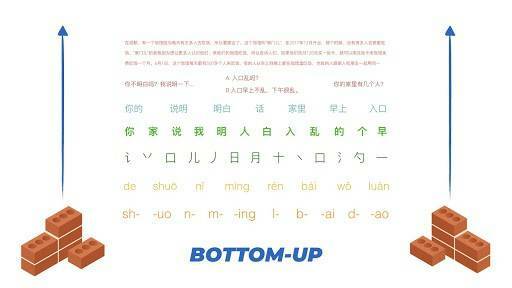 Once Luke started developing a logical balance between bottom-up and top-down learning, studying became a fruitful and fun process. He was finally learning holistically. Learning holistically means maintaining a delicate balance between the top-down and bottom-up approaches, to the point where you only really learn by building from what you know. You make some bricks; then you use those bricks to build some of the house. This is simple, but also incredibly powerful. Likewise, the further you move away from holistic learning, the more of a “slog” learning tends to be. To learn something effectively, you must try to build on what you already know as logically as much as possible. You’ll notice that there is not only a logical order of steps to follow but that the phases overlap very closely. The sequence is primarily bottom-up. 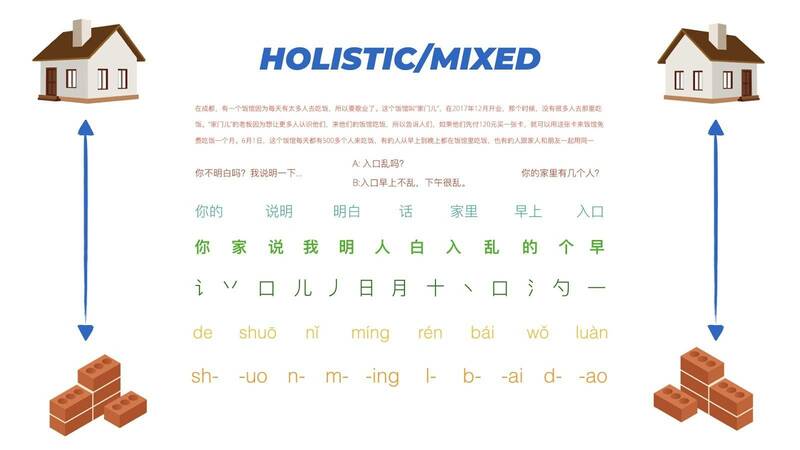 It must be this way with Chinese due to the necessity of characters, but you rarely learn anything out of context, and we focus on the highest frequency characters and words first. In the same way, new words are “unlocked” as soon as their characters are mastered. From there, after accumulating enough words to construct sentences, we give you the structures to do so. 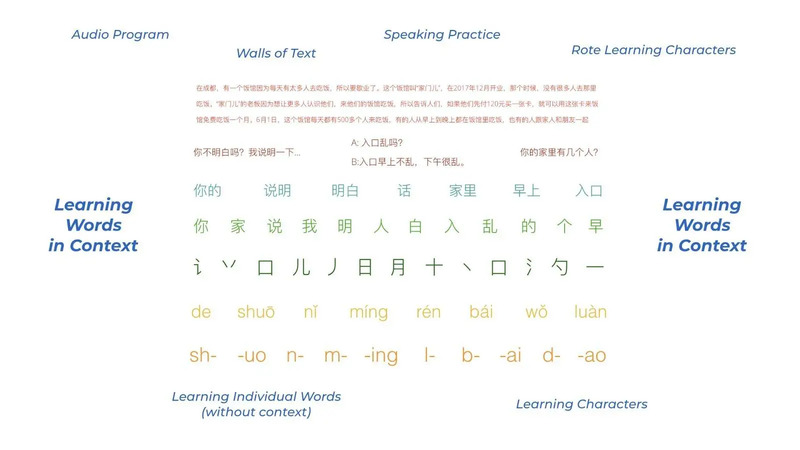 This way, when you learn a new component, you can immediately learn some related and useful characters, or when you learn new characters directly learn some relevant and valuable words. We transformed this idea into The Mandarin Blueprint Method video curriculum, which is available for purchase right now.